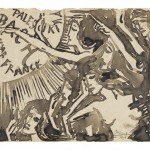 This fall the Museum of Fine Arts, Boston showcases its collection of Dutch works on paper from the turn of the 20th century. Johannes Theodorus Toorop, Allegory: Music Inspiring the Arts, 1896. Dutch-Indonesian artist Johannes Theodorus Toorop, known popularly as Jan Toorop, was one of the leading figures of Holland’s Art Nouveau movement. According to Clifford Ackley, the Department Chair and Ruth and Carl J. Shapiro Curator of Prints and Drawings at the Museum of Fine Arts, Boston, he was supposed to become a colonial administrator, but his primary love was drawing. “Slowly, with the help of the Dutch people,” says Ackley, “he convinced his father to let him become an artist.” Toorop’s father was Dutch and Indonesian and his mother was English and Chinese. His work, which is featured prominently in the MFA’s current exhibition “Holland on Paper” (through February 23), incorporates many design elements from his heritage. The artist’s 1894 poster Delft Salad Oil (Delftsche Slaolie) was designed for the Netherlands Oil Factory (NOF) in Delft, a company that sourced peanuts from Indonesia to make its oil. Toorop illustrates a group of Indonesian peanuts displayed within a border of vines in the top-left of his poster, right next to the NOF’s modernized medieval crest. The two female figures Toorop has pictured gracefully dressing and practically exalting the salad were inspired by Javanese shadow puppets. 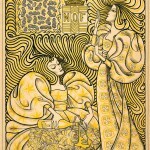 They wear flowing dresses adorned with yellow batik-inspired designs, and the thick, hooked yellow and black lines of their hair fill the poster’s negative space. 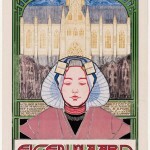 The poster, which was seen as a revolutionary design at the time, inspired the Dutch people to refer to Art Nouveau as Slaolie or “salad-oil” style. “It was a period when, in order to have fresh stimulation and new perspectives, artists turned to earlier art such as medieval art and early Egyptian art, and the art of other places, such as Japan or Indonesia,” says Ackley. Carel Adolph Lion Cachet’s contribution to an 1899 lithograph calendar, which he designed with Gerrit Willem Dijsselhof and Theo Nieuwenhuis, with its flamboyant and wildly organic design, showcases Lion Cachet’s preoccupation with batik textiles. The composition of Theodorus van Hoytema’s lithographs Christmas Eve (Kernstnacht) and New Year (Nieuwejaar) are not unlike those of Japanese ukiyo-e prints of the 19th century. Their details of snow dripping heavily from tree branches seem to further this comparison. As japonisme swept Europe following the Meiji Restoration in Japan and the country’s reopening to trade and cultural contact with the West after more than 200 years of seclusion, these Eastern design elements fascinated European artists and became essential to Art Nouveau’s aesthetic features. As can be seen from the depiction of peacocks in New Year and that of owls and geese in Christmas Eve, and from his interpretation of Hans Christian Andersen’s fable in The Ugly Duckling (1893), which is also featured among other pieces of his in the exhibition, Hoytema found much of his inspiration in the nuance and movement of the natural world. 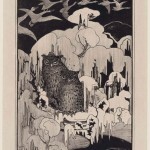 A preoccupation with nature and its patterns pervades Art Nouveau and is evident throughout this exhibition’s posters, decorative calendars, illustrated books, prints and drawings. One of the highlights, Kunst en Samenleving, a translation of Walter Crane’s Claims of Decorative Art, published in Amsterdam by Scheltema & Holkema’s Boekhendel in 1903, features 35 woodcut vignettes by Dijsselhof. Printed on homemade paper, they feature frogs’ eggs and eyes, as well as other symmetrical patterns inspired by animal parts. The book’s leather cover is adorned with gilt-stamped lobsters. “It’s one of the outstanding book productions of the period,” says Ackley. “Crane’s Claims of Decorative Art has a lot to do with artists enriching lives and using socialism as a guide to enriching society.” Inspired by this thesis, and by England’s Arts and Crafts movement, Dutch artists of the period ventured to create posters, children’s books and interior decorations that could improve quality of life through beauty and sensible design. When Ackley started building the collection, the museum had already acquired Vincent van Gogh’s etching Portrait of Dr. Gachet (Man with the Pipe), from 1890, and Piet Mondrian’s Trees along the Gein River, from 1905–06, two of the show’s better-known works. Van Gogh printed the piece, the sole etching in his oeuvre, with help from his subject, Dr. Paul Gachet, a homeopathic practitioner from Auvers-sur-Oise, near Paris, who was also an amateur etcher. 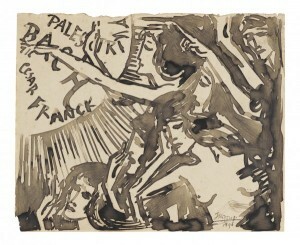 Mondrian’s drawing, which was executed in charcoal on blue paper with visible erasure and smudging, shows the artist utilizing Art Nouveau’s penchant for organic forms before his transition into geometric forms.